Losing your hair is always difficult, but one of the hardest types to deal with can be partial hair loss. Whether it's thinning dramatically or coming out in patches, styling becomes a major issue. What's more, people are often unsympathetic. Partial hair loss can be just as traumatic as losing all of your hair. It's important to give yourself the space you need to deal with this emotionally, and you shouldn't feel bad about expressing your distress to those close to you. But don't despair – you are far from being alone with your problem, and there are still things you can do to improve your situation. Often Hair Loss is simply a part of the Ageing Process. If you find your hair thinning over time, it's probably nothing to worry about. If, however, your hair thins dramatically over just a couple of months, or if it starts to come out in patches, you should See A Doctor. There are many possible causes of patchy hair loss, including tugging at the hair, which people can do without realising it or during their sleep. In these cases, switching to a shorter style is often the solution. Partial hair loss can also be caused by autoimmune problems in which the immune system attacks the scalp. Sometimes they occur simply as a result of Stress, and sometimes they are caused by Poor Diet, by parasite infestation or by infection. One common cause which most people are unaware of is tooth infection, which can spread to the hair follicles. If your doctor can't explain what's wrong, try a dentist. What to do with the Remaining Hair? When you've lost a lot of your hair, deciding what to do with the rest of it can be difficult. Conventional treatments for baldness can risk damaging your remaining hair. 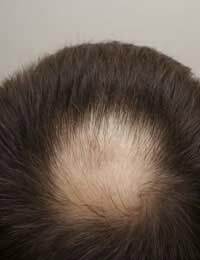 There are localised treatments available for bald patches and these are a better solution. You can massage them directly into the scalp in the affected areas. They also present fewer risks of medical complications than systemic treatments. When it's still healthy and what's left of it is attractive, you may be hesitant to shave your hair off, especially if you expect the lost hair to grow back at some point. Temporarily wearing a Wig, Toupée, scarf or hat is one solution, but shouldn't be done before you know the cause of patchy hair loss. This is because it can worsen allergic conditions of the scalp and may sometimes make the hair loss worse. Patchy hair usually looks better if kept short. This also means that it won't look so uneven if hair starts to regrow on the bald patches. There are an increasing number of options available for concealing bald patches in otherwise healthy hair. If your hair is short, Hair Patches can be woven into it to disguise the damaged areas. If you have long hair, cutting it short will help to disguise its unevenness, and the hair that is cut off can be used to patch the holes, ensuring a perfect match.